Now an unusual new twist has emerged over the final resting place of Simon Fraser, 11th Lord Lovat. The new row centres on whether the right coffin was opened by investigators. The custodians of a mausoleum believed to have been the last resting place of the notorious chief maintain that the correct coffin was examined, but admit they are still baffled by the mystery. The contents of the lead coffin at Wardlaw Mausoleum, near Inverness, were the subject of a forensic examination. It had been expected the remains of Simon Fraser, 11th Lord Lovat and known as The Old Fox, would be inside. After no trace of him was found, author Sarah Fraser has asked if his remains were scattered and now long gone. What were discovered inside the coffin were the remains of a headless young woman and bones from four other people, including a child. Fraser, who has written extensively about the Old Fox and is involved in the effort to end the mystery of his final resting place, has suggested Lovat’s coffin plate may have been switched. 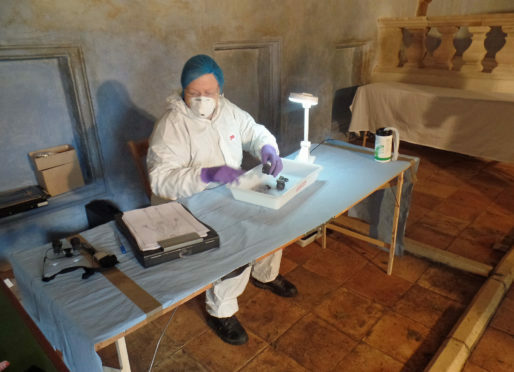 A team led by forensic anthropologist Dame Sue Black, of the University of Dundee’s Centre for Anatomy and Human Identification, worked with historian Dan Snow on the forensic examination and revealed the results last month. Wardlaw Mausoleum Trust said the author had raised an interesting question amid the continuing mystery about the clan chief. In a post on its website, the trust said the coffin opened last October had all the hallmarks of having been specially made for the Old Fox, and having the correct plate. The trust said work would continue to try to identify the young woman and the other remains found in the coffin. “There was an interesting post from Sarah Fraser recently – did the coffin we examined belong to Simon the Fox? “The name plate, double lead coffin, and family tradition, all indicate that the coffin on the far left of the crypt that we opened was made for Simon the Fox. The Old Fox is today known to readers and TV audiences as the grandfather of Jamie Fraser, the lead character in the popular “Outlander” series.